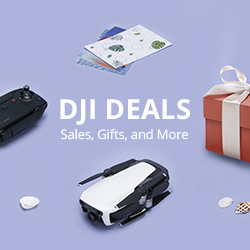 Which drone to buy for Christmas? Christmas 2018 is fast approaching, and if you are in the market for a new or upgraded drone, here is your guide for the best drone to buy this Christmas. To help you, here is some basic drone/quadcopter background information. Each drone will typically have an X- or H-shaped frame which is then lifted by four rotors. The general setup is to use 2 sets of identical propellers – two of which will be rotating clockwise and the other two rotating counter-clockwise. This is controlled with a gyroscope and/or accelerometer which measure the aircraft’s roll, pitch and yaw – in other words how the drone is positioned. With this positioning data, the onboard computer in the drone will control the rotors automatically and individually each is adjusted, so the drone can hover in place. 1. Flight time – this really goes without saying. The longer the flight time the longer you have to fly your new drone. Flight time can vary anywhere between 5 and 30 minutes depending on the time and quality of the drone you are buying. One solution is to buy spare batteries for your drone. 2. Camera. If you are buying a drone it is highly likely you are wanting to buy it to take some photos. Some drones include their own attached-to-the-body cameras, while others are GoPro (or other action cameras) ready. Just like a smartphone, you need to look at the camera spec on offer if you are wanting to get the best for your photos from your drone. 3. Return to Home (RTH) functionality. This is essential for beginners, but generally only available on more expensive drones. Essentially it means if you are losing your drone or control of your drone, you can hit a RTH button which will make the drone return to where it took off from. One thing to be aware with this is some cheaper drones when doing this will not avoid obstacles between the RTH location and the current location of the drone.